I've spoken about my cats a few times on the blog now and I'd like to start doing more pet posts on here. For those of you who aren't aware, I have two male cats Buddy and Dobby who are brothers. They are almost 3 now and they joined my little family when they were nine weeks old. 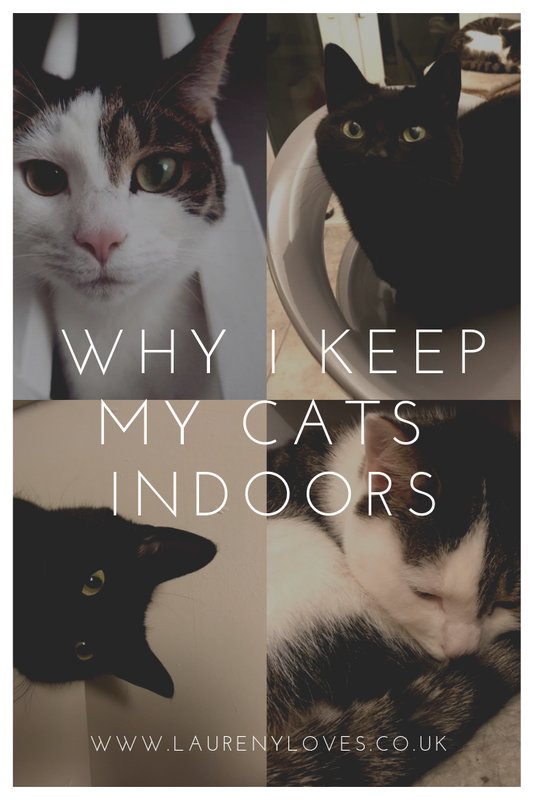 Today I thought I'd talk about why I came to the decision to keep them both indoors and a bit about my experience of having indoor cats. This is actually in the lead up to another post I have planned about everything you need to know about indoor cats but I thought it would be good to start with my experience of it. Buddy and Dobby joined our family in August 2016 not long after Josh and I moved in together. We'd always known we'd get a cat as Josh had always had them and I loved them. The original plan was to only get one cat but that quickly changed when we saw Buddy all on his own so we ended up with two cats from the same litter. At the time we both worked in schools so we'd decided to keep them indoors over winter (they weren't neutered until January so we wouldn't have let them out before then anyway) and then introduce them to the outside world when the weather warmed up, they were a bit bigger and we had time off work. We didn't want their first experience of being outside as us throwing them out the door before we headed off to work for the day. I think it was around Easter time when we first let them outside. At the time they had a huge pet pen/bag similar to this so we put them in that and brought it outside and opened it up then they could come out in their own time. Their first time out wasn't too bad, they explored our garden (we have a huge garden), popped next door then came back home, they stuck together the whole time though. The next day we opened our kitchen doors and let them come out in their own time, Buddy came out first and immediately I could tell he wasn't enjoying it, his eyes were wide, he was really alert and jumpy. We tried playing with him and he just wasn't interested, he jumped at every little noise and eventually ran back inside. As for Dobby, well he never even made it out of the kitchen! He came to the door looked around and walked back in the house, he did this a few times but never actually came outside, he just seemed really timid and disinterested in being outside. So aside from the fact the neither cat seemed interested in being outside a few other factors cemented our decision to keep them indoors. Obviously we didn't want to push them into going outside if it scared them, to this day I still don't know what scared Buddy so much but he does go through phases of being really jumpy and scared so maybe it was that. As for Dobby, I didn't want to push him out when he wasn't even interested in being outside, he'd had plenty of time to come out if he wanted, he's always been quite timid around people and even now he's not a massive fan of visitors. We're pretty sure he was the runt of the litter as even now he's pretty small compared to his brother so I just don't think being outside suited his personality! Also at the time we moved major building work was due to take place and the empty land directly behind our house, the work actually hasn't started yet but I didn't feel comfortable with the cats being so close to a building site. Another big factor was the number of reports of animal abuse in our village, now I like to think we leave in quite a nice village and our street is lovely but Josh used to live about 5 minutes away from where we moved and one of his cats was shot and another died from suspected poisoning, sadly these don't seem to be isolated incidents and reports like that happen quite regularly around here, so for their own safety and my own peace of mind we decided to let them be indoor cats. For me the biggest pro of keeping Buddy and Dobby inside is that I know they're safe. I also believe in the long term it's reducing the cost of vets bills, we're certainly never going to incur any of the charges you might face with an outdoor cat from accidents that occur. We know exactly what they're doing and eating meaning they're in tip top condition. In fact at the last vets checkup and vaccination booster the vet commented that they were the healthiest looking cats she'd seen in a while and that they're coats were in amazing condition. Proud mama right here! Spending a lot of time and bonding with the cats is also a massive plus for me, I've spoken before about why I think pets are great for your mental health and I just love having my boys around all the time. They seem to know I've I'm not feeling 100% with an IBS flare up or if I've had a bad day. The fact that indoor cats require more attention is a pro for me because I am more than willing to spend time with them, I'm home from work fairly early and Josh works from home at the moment so they always have someone around. Personally, I can only think of one con of my situation and that's the litter tray. I'm so self conscious that my house smells like a cat toilet because I know it's such a strong smell and for people who don't have cats or a litter tray in their house, I know that they'll be able to smell it because Josh and I stopped noticing it a long time back. We always keep on top of emptying the tray and giving it a good scrub down every now and then and you'll always find me burning candles and wax melts! Emptying the litter tray is hands down my least favourite thing about owning a cat but it has to be done and they have to go to the toilet somewhere seen as they live indoors, so short of doing a Jack Byrnes from Meet the Parents and teaching them to use the toilet then we're stuck with the litter tray! Will they ever go outside? Not now, no. Buddy and Dobby are almost 3 now and I think at this stage it would be unfair to put them outside, the situation works so why mess with it. They never really show any interest in being outside now, in fact there's been many occasions where a door has been left open by accident or we've quickly popped outside and left the door open and neither of them have bothered coming out, they've even on occasion walked past an open door, sniffed the air and walked off!